Monumentality-Fragility is an international exhibition of curated works from the 2018 European Prize for Applied Arts, that will be hosted at the Kildare National Gallery from the 9th February 2019. The prize, which is organised by the World Crafts Council, aims to reward the best creations of contemporary expression in applied arts and craftsmanship. It looked into monumental and fragile, the strong colour palette, exuberant proportions, the power and the violence allude to a monumental character from which a palpable fragility is released. With the European Triennial these two words were also part of the monumentality of this institution and the fragility of the nations and entities that make it up. Artists were asked to take inspiration from the paradoxical of this 2 themes. 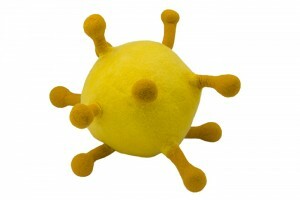 Niki’s submission consisted of three sculptures of viruses: the Common Cold, Hepatitis B and Herpes. Each of these has disrupted our contemporary culture by changing our conversation on monumental and fragile. Viruses as living organisms are still both a challenge and a mystery regardless of our scientific advances. Doctors as part of the current perception of ”The Establishment” are often held hostage to our perception of them being heroes rather than humans. Here the concept of small and significant are juxtaposed using scientific concepts to mirror our own fears. As viruses are necessary ingredient to life on our planet the destruction of them explores what is an act of heroism and an act of fear? The interrelation between personal fears – our vulnerability and resilience and how they influence macro decisions related to health and life. It is also a dialogue of what makes an object beautiful to us- its form or its function? The works are developed as wet felted sculptures. The Common Cold virus is one of the best known surviving organism on earth. It is a symbolic tale of how survival of the species is mostly about the ability to grow in change. The Herpes virus and Hep B are part of the history of gay rights as they have made the invisible visible and as such started the conversation of what we sweep under the carpet. The viruses have previously been curated for DCCoI Pattern, Design Week in Bulgaria, West Cork Art Festival. Further details on these sculptures as well as sculptures of other viruses can be found here.